2005/08/09: I've been away from city for some time. This is a rush update, from Dominion (Heartland will be later) - here's Tilburg, here's Lokeren. Nobody sent any exclusive stuff - oh well, Europeans are always more closed than Americans. 2005/08/05 (second update): Yipee! We're back in the old address - thanks, Wim! 2005/08/05: News on personnel changes; Wien tickets are not for sale anymore. 2005/08/04 (second update): News on Wien venue change. More links to images in Leeds (from Dominion/Heartland). 2005/08/04: More Leeds reviews (including one exclusive to this site). 2005/08/03 (second update): In Leeds section: new pictures (exclusive to this site), setlist picture, links to photos, RealPlayer video clips, (crappy) recording of the gig, new reviews. Non-exclusive stuff comes from both Heartland or Dominion. Also, rewritten news page and lineup page. Note the new handy "media" section in news page. 2005/08/03: Emergency move to a termporary new server (until end-August, when the webmaster gets back home and fixes the permanent one). And emergency Leeds page (unique pictures, review/setlist from Heartland). Some more pictures are available in Heatland thread here. 2005/08/02: Got distracted by wheels spinning. That was good, as were several weeks in Italy. Service is back to normal. With this settled: SISTERS ARE PLAYING FREE GIG IN LEEDS ON AUGUST 2ND!!! (too bad it starts in few hours; the wheels were spinning for too long). More additions: fixed highway number for Hildesheim (it's near #7); fixed ticket information for Hildesheim (two day tickets now available); Hildesheim ticket scan added. 2005/06/06: Not strictly Sisters-related, but The Cure are playing in Lokerse on August 10th. If you're not following Sisters southwards, you might wanna stick in Lokerse for a while. 2005/06/01: RoboCrist's involvment is confirmed. 2005/05/26: Love Planet capacity and several corrections. 2005/05/24: Tabor has tickets information, its homepage is now http://www.loveplanet.cz, not http://www.interkoncerts.cz, support acts are known. I'm about a week late on this one, but nobody wrote to complain, so probably nobody noticed it. Or nobody cares. 2005/05/15: Lokeren price is confirmed at €10. 2005/05/07: Getting-there information for Tabor. Iggy information in Lokeren. Zurich capacity. Blurb on hidden comments in Hildesheim. Festival lineup lines in festivals (empty-ish). 2005/05/04: The official Sisters live news page was finally updated giving us two more dates: Wien (AT) on August 11 and Tabor (CZ) on August 12. No tickets information about them yet. 2005/05/01: Zürich ticket scan added, as pictured right. It's the second scan sent in by Eggi - thanks! And concertlist on right of webpages now links to appropriate places. Also, in the week since our last update the far-reaching-hand has corrected the M'era Luna bands list giving Sisters the top spot (Skinny Puppy were the first, as of 04/24). 2005/04/24: Zürich date added, "getting there" directions added to all gigs, possible Lokeren price of €7 added and M'Era Luna tickets information added to main webpage. And a Wiesen tidbit: Sisters headlining spot was given to Lacrimosa. 2005/04/09: Added Tilburg ticket scan (main page), Tilburg venue capacity. Rewrote main page (no new information). Lineup changes rumours now have their own page. Added Heartland forums post with insider information on possible RoboChrist's (non)involvement. 2005/04/08: Added two rumours: that Adam quit and that RoboChrist will play with (or maybe within) the band this summer. 2005/03/31: The flood of gig annoucements from European festivals makes it obvious the summer tour is a go. Even if official live news page is as bare as before. Sisters are doing 2005/08/06, Tilburg, Netherlands date - so found Beata. More information here: http://www.013web.nl. Presale of tickets starts this Saturday through "VVK" (if you don't know what it is, you probably don't need to). They are also playing in between 2005/08/05-14 in Lokerse Feesten, Lokeren, Belgium, as Christoffel Dhaen reported. More info at http://www.lokersefeesten.be. Last year the tickets for each day of the festival were only available on the day and cost 7 euros. It's not clear (to us, at least) how they will be sold this year. Note that Iggy and the Stooges are also appearing in the festival too (and are definitelly worth a look). Because the tour looks happening, we're starting the tour 2005 section. TA dum. Letters of joy to a graveyeard somewhere between Lithuania and Estonia, please. The one which is not there. 2005/03/23: Apparently, Sisters are appearing in M'era Luna festival in Germany on 2005/08/13 or 14. The location is near near Hannover. More information here. Still nothing on the official live news page. Just as it says there, "it's because [Sisters]'re not about to play much (or at all) in the next few months, or because [Sisters]'re not yet in a position to confirm more than you see [in the official live news page]". The band has played in the M'era Luna festival in 2000 and 2002. 2005/02/23: It seems (although not 100% sure yet) the Sisters European summer tour 2005 is in works, although no dates are known yet; certainly none are yet listed on the official live news page. 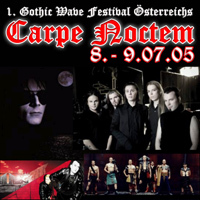 The band was advertised as appearing in the Carpe Noctem festival in Wiesen, Austria (on July 8 or 9). However, soon news about the gig spread among the internet fans, the band was removed from the festival lineup. The organizers claim this is due to Sisters revoking their contract with reason given that the festival is being promoted as goth event.